Nothing tastes better than juicy fresh fruit, especially as the months become warmer. Something about sweet, ripe pineapple is thirst quenching and satisfying, not to mention delicious. While I usually have a huge bowl of fresh fruit in my refrigerator ready to go, you can also get really creative with fruit salads by easily jazzing them up with unique flavors. In this recipe, I used fresh pineapple, mango, berries and kiwi, and tossed it all in a lime-infused Thai red chili pepper dressing. This combo is sweet with a super-spicy kick. Don’t worry, it’s not overpowering and adds just the right balance of flavor. If you are worried, start small with the heat, and gradually add more to your liking. This salad will stay fresh for several days when kept chilled, and it’s even great alongside grilled chicken or shrimp. This sweet yet spicy salad full of fresh pineapple and other fruits is tossed in a tangy Thai red pepper dressing and served chilled. 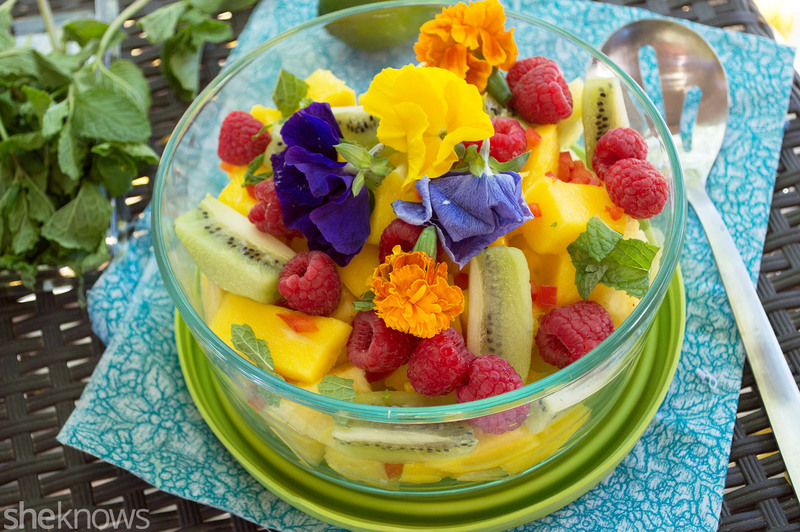 You can find beautiful edible flowers in the produce sections of most health food or grocery stores. To a clean jar with a lid, add all the ingredients for the dressing. Place the lid tightly on the jar, and shake for 30 seconds to mix all the ingredients. 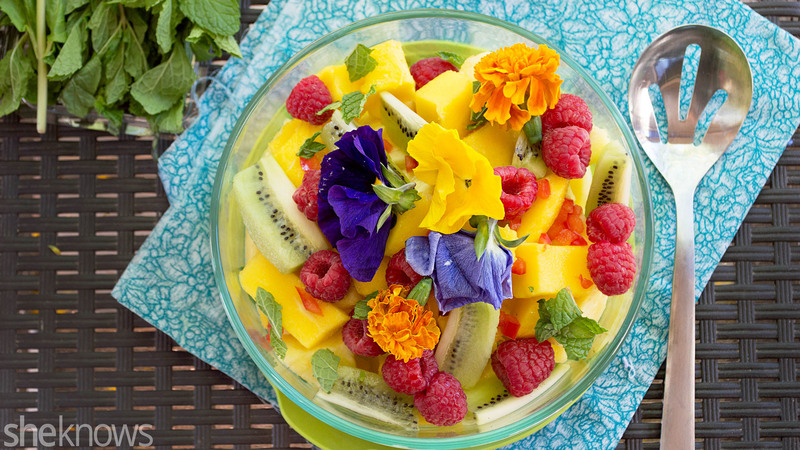 To a large bowl, add all the fresh fruit and the chopped mint. Drizzle the dressing over the salad, and mix very well, coating all the fruit. Cover the bowl with plastic wrap or a lid, and chill for 30 minutes to allow the flavors to blend. When ready to serve, remove from the refrigerator, and toss well again. Garnish the salad with fresh mint leaves and edible flowers, if desired. For tons of great recipes, like our I <3 Comfort Food page on Facebook.